Proudly Serving Dothan, Enterprise, and Andalusia Drivers! Constructed from high-tensile strength steel and equipped with projector headlights and different engine options, the sleek Hyundai Elantra satisfies the needs of an array of drivers. If you're looking for seating for seven, numerous safety systems and impressive amenities such as a panoramic sunroof, you're looking for a Hyundai Santa Fe! Secure a family-friendly ride that features a 2.4-liter 4-cylinder engine, Blind Spot Detection and Rear Cross-traffic Alert, find a Hyundai Sonata today! The competitively priced Hyundai Tucson boasts a hands-free smart liftgate, 7-speed EcoShift® Dual Clutch Transmission and LED low-beam headlights, so find yours now! Mitchell Hyundai of Enterprise, Alabama invites local drivers to shop and explore our full-service car dealership for new and pre-owned Hyundai vehicles, plus a range of automotive services. Our Hyundai dealership is part of the Mitchell Automotive Group that has been serving Alabama communities for over 30 years. If you're interested in exploring a range of Hyundai vehicles and resources and working with a team that values your satisfaction, then you're looking for Mitchell Hyundai! Visit us for an informative test drive and learn more about our exclusive, 20-year/200,000-mile warranty. Or, take some time to browse our interactive website and get a feel for all that our Hyundai dealership near Dothan, AL can do for you! From offering the latest Hyundai cars, crossovers and SUVs to competitive pricing and hassle-free financing services, Mitchell Hyundai is here to meet the needs of every Ozark, AL area motorist. Remember that when you purchase a new or used car from our dealership, we are committed to your satisfaction long after you drive off our lot. With our on-site service center and parts department, your Hyundai can remain in peak form, so be sure to visit us for all of your oil changes, tire service and genuine Hyundai parts! End your search for a new car or SUV near Andalusia, Alabama by heading to Mitchell Hyundai, where you can shop our new Hyundai inventory. Our vehicles are priced competitively, and we offer a range of lease offers and financing incentives. Did we mention that we double Hyundai's already fantastic warranty and provide you with a 20-year or 200,000-mile limited powertrain warranty? Browse our Hyundai selection online or visit our dealership for a customized shopping plan. 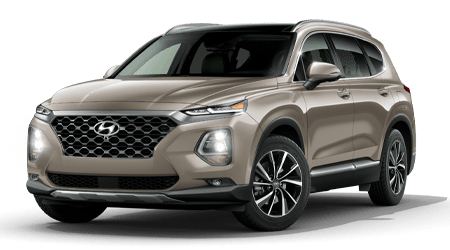 With competitively-priced Hyundai models in stock like the new Santa Fe, you are sure to find a new Hyundai that meets your driving needs and is easy on your budget! Whether you're searching for a new Hyundai Santa Fe or a quality pre-owned Hyundai, know that Mitchell Hyundai's finance department is eager to help you obtain the loan you'll need. We've helped drivers of all credit ratings, including those that are in sub-prime situations, and we're eager to learn how we can assist you. Send our finance experts a secure credit application online now to explore the packages that are available to you, and we'll be in touch shortly to offer our assistance. Don't forget to utilize our payment calculator and vehicle appraisal tools here on our website as you shop for your new or used Hyundai! When you're looking to acquire genuine Hyundai parts so that you can complete auto maintenance at home, our parts department is standing by, ready to help! Let your Hyundai perform as intended and stay within factory specifications with genuine Hyundai parts and accessories from our dealership. Our in-house Hyundai parts specialists are here to assist with your parts request, so don't hesitate to contact our team or visit our customer parts counter at our Enterprise, AL dealership. Thanks to our website's parts request form, you can secure the authentic Hyundai items you are after with the convenience of online ordering. Finding a dependable pre-owned vehicle is a breeze here at Mitchell Hyundai, thanks to our extensive selection of used cars for sale from a range of quality automakers. Our used vehicle inventory goes through a rigorous inspection process so that each vehicle can live up to our high standards and provide you with driving peace of mind. Our collection of Hyundai Certified Pre-Owned Vehicles (CPO) undergo a thorough reconditioning process as well and come with a vehicle history report, as well as an extended factory warranty. Let our dedicates sales associates join in on your used car search when you submit details about your next vehicle through our car finder form. Let our new and used Hyundai dealership team near Ozark, AL help you keep your new Hyundai Tucson running smoothly with our array of routine maintenance services. Bring your Hyundai into our factory-trained technicians for a quick tire rotation or oil and filter change today, or book a service appointment for new tire installation or brake service. Check out our Hyundai service specials before booking an appointment online with our professional service team. Remember that our helpful service advisors are here to answer any of your car care questions, so contact us today or stop by for that oil change when you are in the area! Whether we're reviewing the features of Hyundai vehicles and our new car warranty, supporting the Fort Rucker military community or sponsoring a Toys For Tots event, our new and used Hyundai dealership in Enterprise, Alabama is dedicated to providing for the needs of the communities we serve. Contact Mitchell Hyundai for the high level of care that you deserve! With our range of online services, you can accomplish a great deal in your car search and financing process even before you visit us from nearby Dothan, AL. Remember to turn to Mitchell Hyundai for comprehensive automotive services at driver-friendly prices!